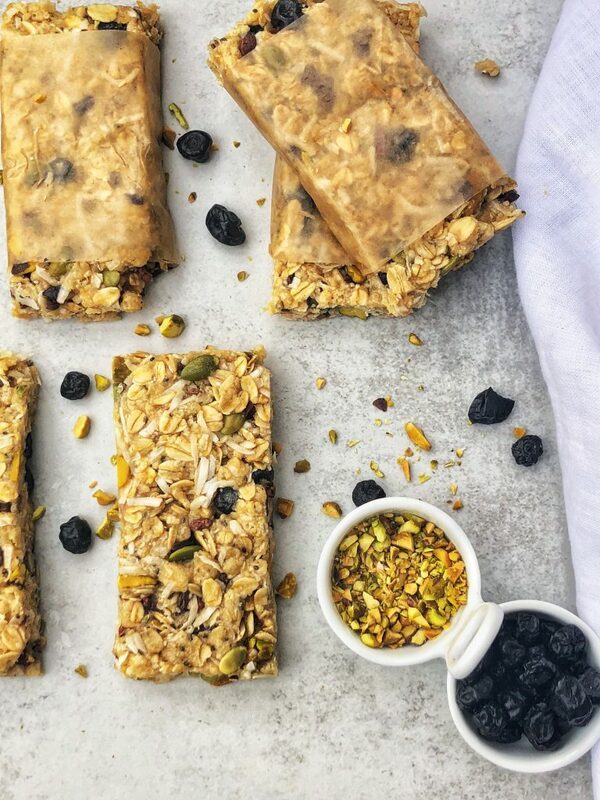 Granola bars are my favorite go to snack mid-morning or late afternoon. They are great for pre/post workout fuel, or when you do not have time to make breakfast. I know the grocery has an entire wall of granola bars, but I prefer to make my own when time allows. When I prepare items in my own kitchen I can control the amount of fat and sugar, as well as assure there are no added chemicals and/or preservatives. It also allows me to change up the flavor based on the season, or whatever sounds good that week! This recipe is very versatile, so have fun playing around with your favorite flavors. You can change around the nuts, dried fruit, sweetener and nut/coconut butter if you’d like. 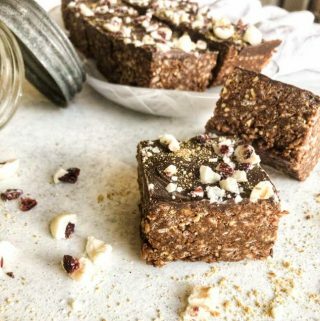 For example, you may easily use walnuts, cranberries, coconut oil and almond butter. The options are endless! If you change around your ingredients just make sure to use a liquid sweetener and not brown or white sugar. These would also be great drizzled with chocolate… :). 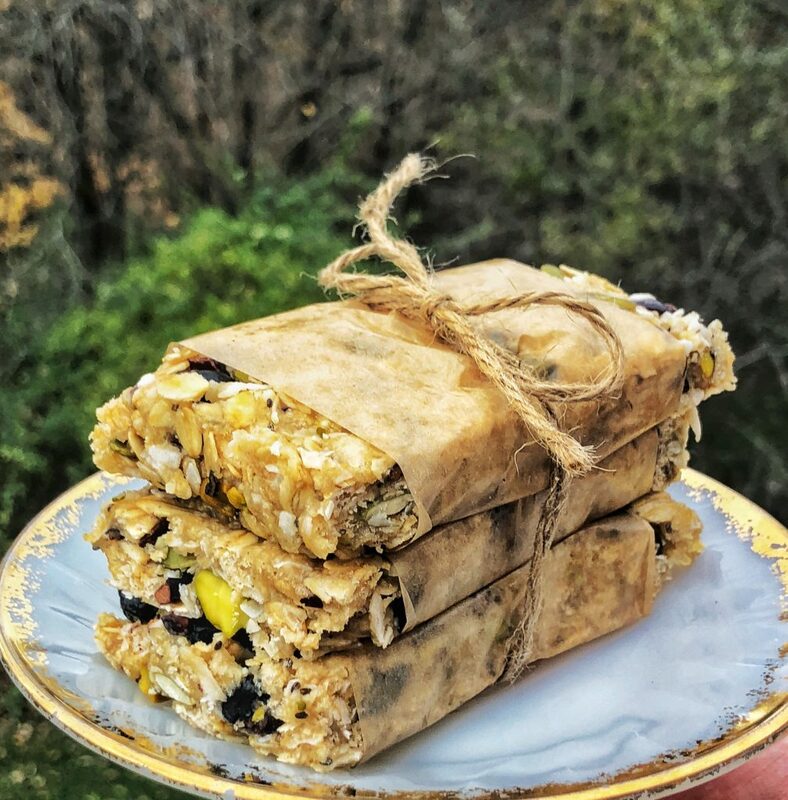 I know the holidays are coming up, and granola bars make great food gifts! Bonus your family member or friend will appreciate a good-for-you gift, versus one full of added sugar and unhealthy fats. Kids will love these too :)! 1. First toast your oats. In a large skillet melt 1 tablespoon of butter over medium heat. Add 2 cups of oats and toast for 5-7 minutes until they appear golden brown with a nutty aroma. Watch them because they can burn quickly! 2. Take off heat and set aside to cool. 3. Line a 9×13 baking pan with parchment. I make my strip almost as wide as the pan (~7 inches), and long enough allow a couple inches for overhang on each side. This makes for a nice handle to lift the bars out of pan after chilling. 4. Combine rice krispies, coconut flakes, pistachios, chia seeds, hemp seeds, cacao nibs, blueberries and salt in a large bowl. Set aside. 5. Place melted coconut butter (see notes below on how to melt) or tahini, maple syrup and oil in a medium sauce pan over medium-low heat. Let mixture warm through for 3-4 minutes, stirring occasionally, until mixture is cohesive and runny. Take off heat and stir in vanilla extract. Set aside. 6. Mix the toasted oats you set aside into bowl of dry ingredients. 7. Next, add wet ingredients to dry by continuously folding mixture together with spatula. Mix until well combined. 8. Transfer granola bar mixture to your prepared 9×13 baking pan. Spread granola evenly over pan and begin to press mixture down into pan with oiled hands. To finish, I like to take a piece of parchment and lay it over the bars, then press down firmly across the entire surface to make sure bars are nicely compact. This step is important considering you do not bake these. 9. Place pan into fridge and chill for 2-3 hours. 10. Remove pan from fridge. Lift bar mixture out of pan via parchment handles and lay on flat surface. Spray a large knife with cooking spray and make one long cut horizontally, diving your mixture into two long rectangles. I then cut each long rectangle vertically 6 times to create 7 bars. If measuring, this is close to 2 inches per bar, 1.8 to be exact :). 11. I wrap each bar in wax paper and store in refrigerator in air-tight container. These bars will soften some if kept out at room temperature for extended periods. • Feel free to use old-fashioned oats if you do not need to eat gluten-free. Also, you do not have to toast your oats. I simply love the flavor and smell of toasted oats. • You can sub maple syrup for honey, agave, brown rice syrup, etc. Just make sure it is a liquid sweetener. • Any nut butter will work in place of tahini or coconut butter. I did not use these because they tend to have a strong flavor and I wanted the blueberry, pistachio and coconut flavors to pull through. • Coconut butter will be very firm in the jar. To melt, I find it easiest to place a saucepan filled with a few cups of water on low over your stove top. You do not want to boil the water, rather warm it. Remove any plastic labels from the coconut butter jar and place it in the pan with water. I usually put in enough water to reach half way up the jar. Allow the jar to rest in warm water for a few minutes. You will be able to stir the mixture shortly after it heats through. It will have a consistency similar to tahini. Now you can measure and carry on baking! I love yogurt and granola…I could probably live off it if, plus peanut butter, if I had to. We have a brunch spot in Indianapolis called Cafe Patachou. 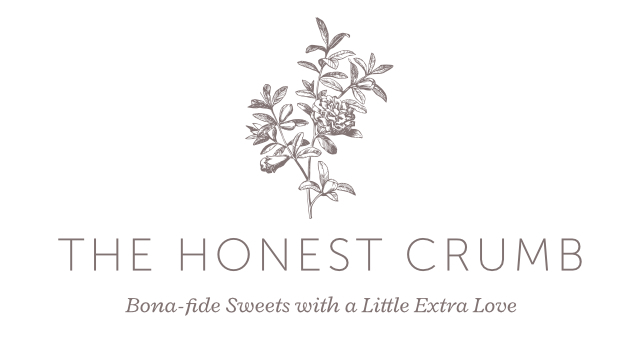 Their granola is soo good! I have tried to re-create it on my own a few times, but been unhappy with the outcome. You can order their granola, but it does not provide the ingredients aside from oats, cherries and raisins. Based on taste I feel it likely includes maple syrup, but again am really unsure. I was out of granola the end of this week and became inspired to give it another try. I am happy to say this granola got me a little excited :). The foundation of this recipe is just what I wanted, and can swap flavors in and out depending on the season. I baked the granola low and slow, and am so glad I did. 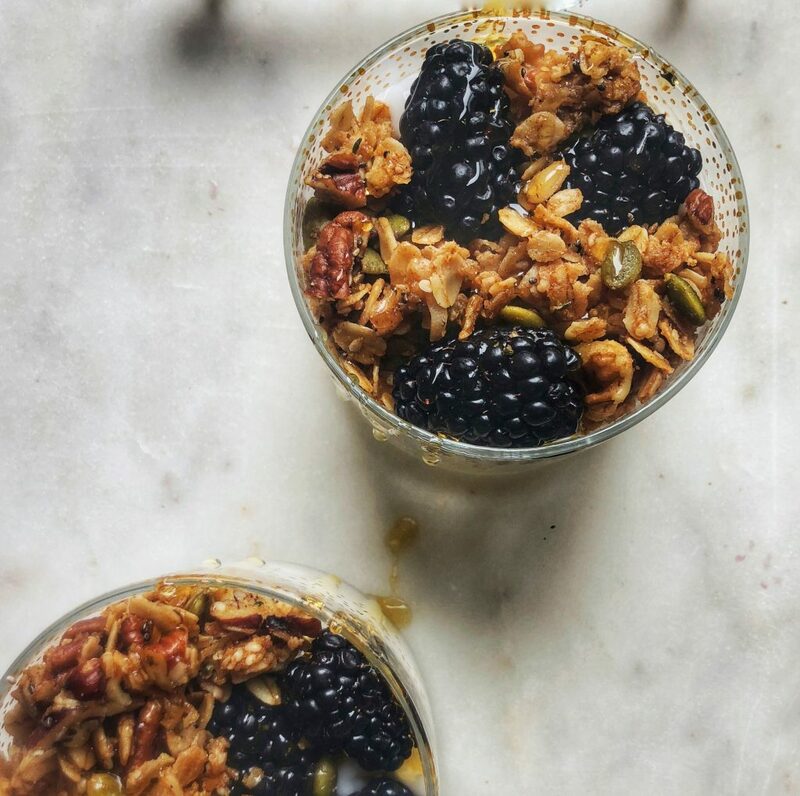 This baking method results in a soft granola, and allows the sugars to really caramelize on the oats…drool. 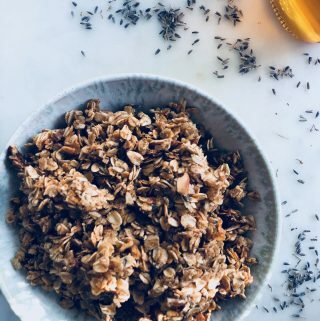 I have burnt more batches of granola than I can count when cooking at higher temperatures, but this method is more forgiving. I strongly prefer the soft texture to this granola, versus oats baked at higher temperatures. 1. Preheat oven to 275 degrees. Line a baking sheet with parchment paper. Set aside. 3. Melt 1/3 cup coconut oil in a microwave safe bowl or in saucepan on stove. Set aside to cool. 2. Combine oats, nuts, pumpkin spice, coconut flakes, salt, chia seeds and hemp seeds in a large bowl. 4. In a medium size mixing bowl combine coconut oil, tahini, maple syrup, coconut sugar and vanilla. Whisk until evenly combined. 5. Add wet ingredients to dry. Combine by folding ingredients together with a spatula. 6. Next separate one egg and discard the yolk. Whisk with a fork until frothy. Add egg white to granola mixture and combine with wooden spoon or fold well with spatula. 7. Spread mixture onto parchment lined baking sheet. It will appear slightly on the wet side, but this is okay, it is suppose to. 8. 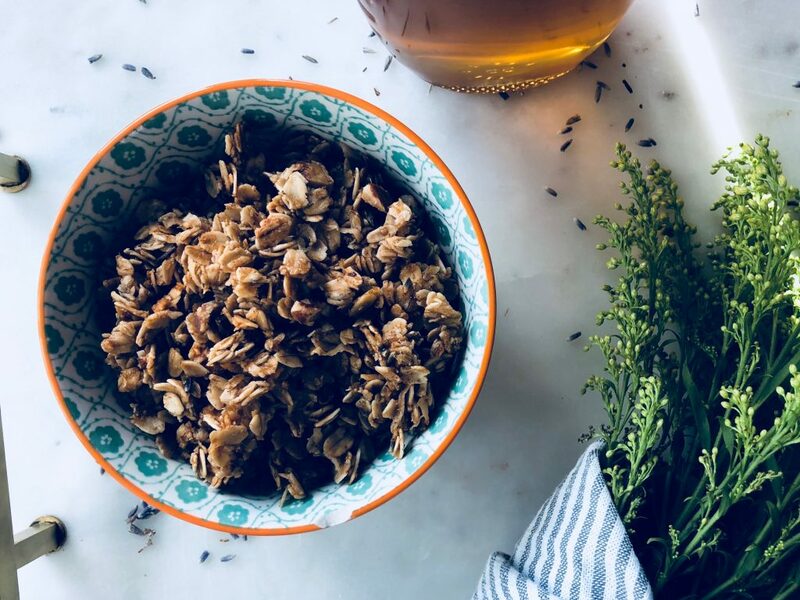 Place granola into preheated 275 oven and bake for approximately 45-50 minutes, stirring every 15-20 minutes. 9. When done the granola will begin to feel a little firm, but still soft. The wetness will be gone. The granola will continue to firm up a bit while cooling on baking tray. 10. Allow granola to cool completely on baking sheet. 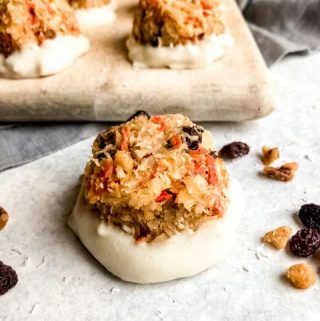 Add any dried fruit you desire. Enjoy immediately over yogurt (I did :)). • You may use regular or gluten free oats, depending on your dietary needs. 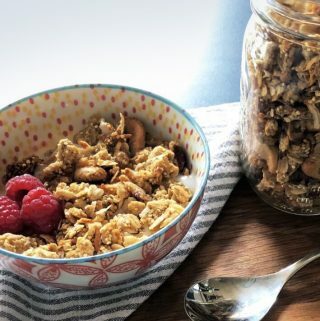 • You may add dried fruit to this granola, just do so once it is cooled. If you add it before you break the dried fruit becomes rock hard. • You can replace the coconut with any oil you would like…or melted butter :). 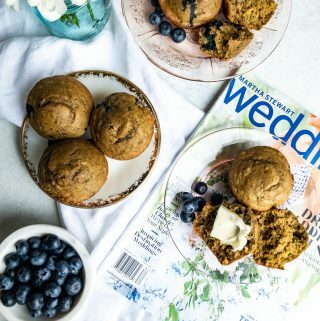 No banana muffin beats Ina Garten’s Banana Crunch muffins. I owe all my inspiration for these to her! 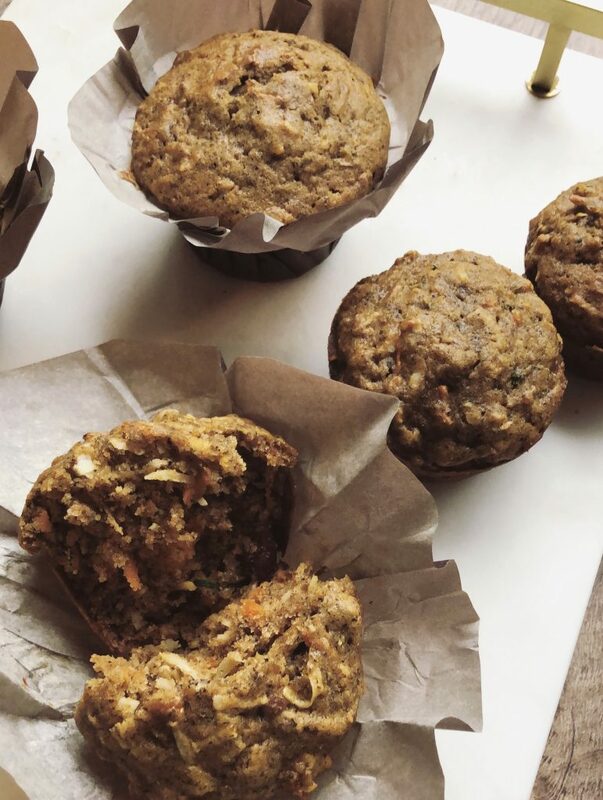 I wanted to create a muffin full of whole grain carbohydrates, fiber and decrease the sugar content to prevent a mid-morning crash. Many of us stay rather busy throughout the morning, and benefit from a breakfast we trust to carry us through to lunch. 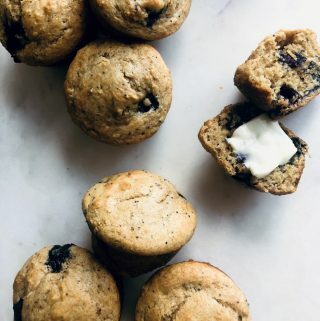 These are just the muffin! 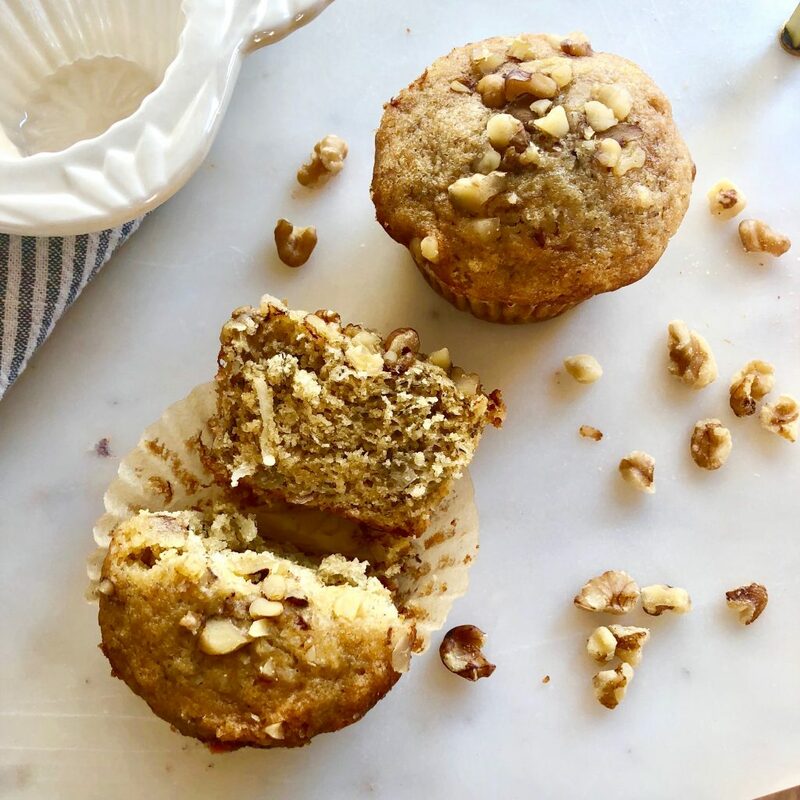 I like to top my muffins with nut butter for an extra serving of healthy fat and protein. 1. Preheat oven to 350 degrees. Spray top of muffin pan with cooking spray, or rub with coconut oil via a paper towel. This prevents muffin edges from sticking to the pan if they rise over. Line with parchment baking cups, or liner of choice. 2. Melt 1/3 cup coconut oil and set aside to cool. Whisk egg in small bowl and set aside. 3. Add flour, almond meal/flour, coconut sugar, baking soda and cinnamon to a medium bowl. Set aside. 4. In a large bowl whisk oil, honey, egg, yogurt, vanilla, milk and mashed banana. 5. Next, fold in dry ingredients with a spatula until just combined. 7. Scoop batter into prepared muffin pan. Fill approximately 3/4 full. 9. Bake for approximately 22-25 minutes until edges are just golden and tooth pick comes out clean, or with a few moist crumbs, when inserted into center. 10. Allow to cool in pan for 5-10 minutes. I find it best to run an offset spatula along edges to ensure the muffins did not stick anywhere. 11. Remove from pan and allow to cool on cooling rack. I use my offset spatula to help me lift the muffins out of the pan. • I use plain coconut yogurt. I posted the type I use in my baking page. • You may replace the almond milk with any milk of choice. • I prefer my chopped banana to not be as ripe as my mashed banana. I tend to use a banana just starting to brown. • You may replace coconut sugar with white sugar. If I have not said it before…I love lavender! 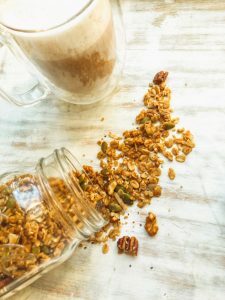 It takes this granola up a notch, and makes you feel you are eating something a little extra special :). Lavender not only tastes wonderful, but helps remind me to relax and slow down. It makes me want to throw on a big comfy robe, brew a cup of tea, put on a face mask and read a good cookbook! If you are not a huge fan of lavender no worries! I recommend replacing the lavender teaspoon for teaspoon with cinnamon. The first time I made this I put in too much, but since have cut the amount in half and feel its just right! 3. Melt 1/4 cup coconut oil in a microwave safe bowl or in saucepan on stove. Set aside to cool. 2. 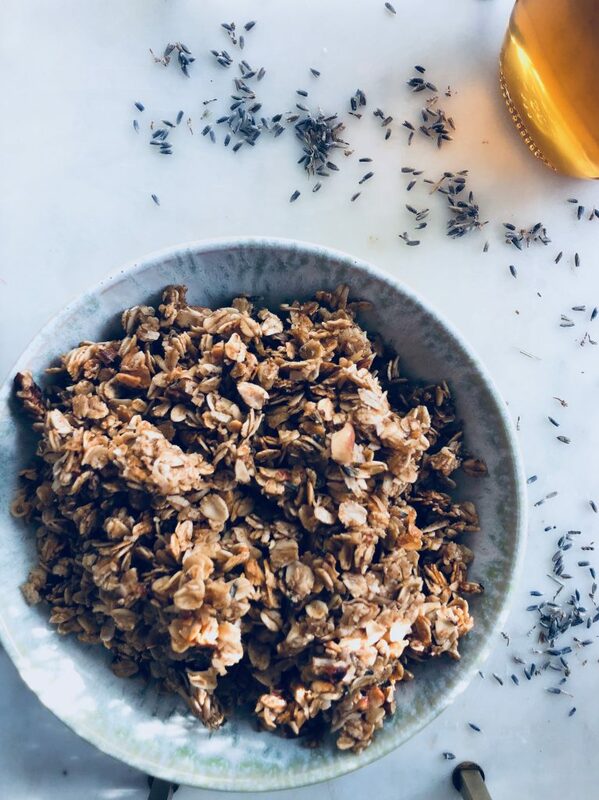 Combine oats, nuts, coconut flakes, coconut sugar, lavender and salt in a large bowl. 4. In a medium size mixing bowl combine coconut oil, honey and vanilla. Whisk until evenly combined. 6. Next separate one egg and discard the yolk. Whisk with a fork until frothy. Add to granola mixture and combine with wooden spoon or fold well with spatula. 7. Spread mixture onto parchment lined baking sheet. This granola will clump a little, therefore I like to spread mine out fairly thin, but also keeping the mixture somewhat touching. 8. Place granola into preheated 275 oven and bake for ~45-50 minutes, stirring every 15-20 minutes. When done the granola will loose its wet appearance, begin to feel firm, but still be slightly soft. This granola is not meant to fully crisp on the oven. When you reach this point remove tray from oven. • You may use only old fashioned regular or gluten free oats, depending on your dietary needs. • You can replace the coconut oil with any oil you would like…or melted butter :). 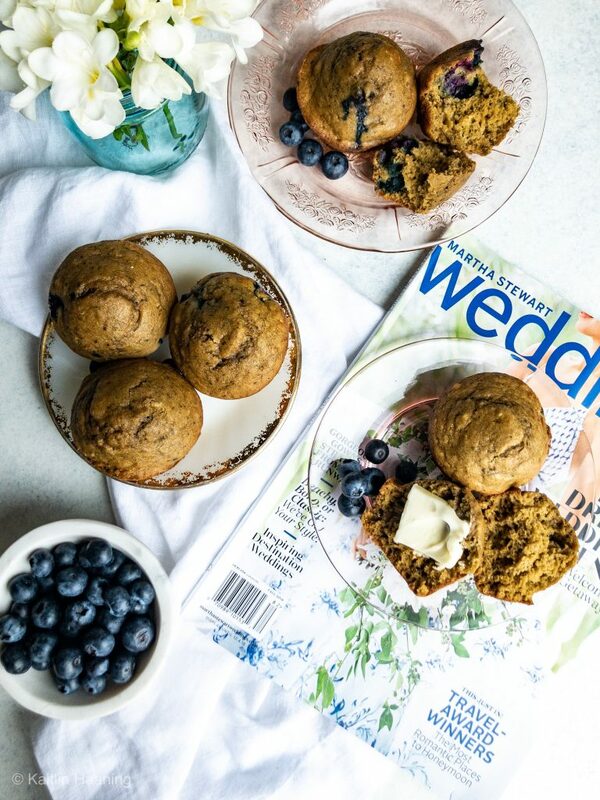 If you want to guarantee yourself a great morning, bake up a batch of these morning glory muffins! 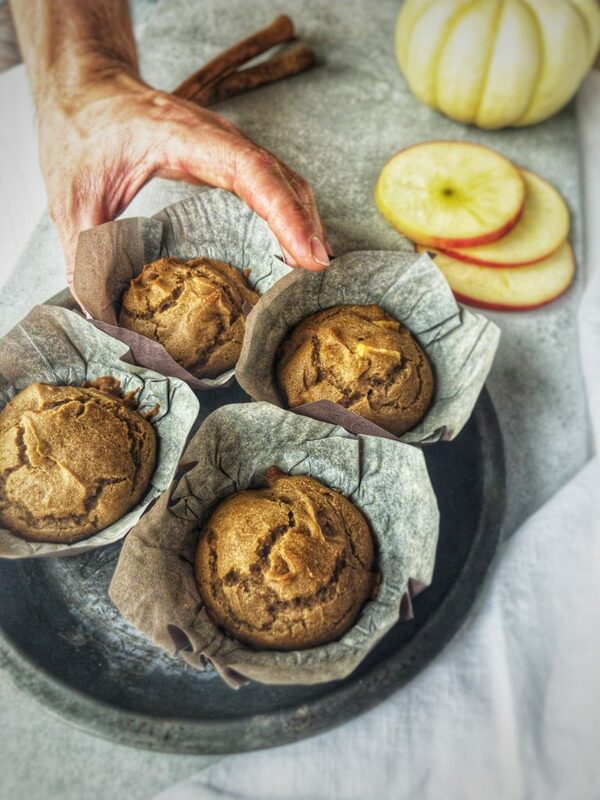 These muffins are full of zucchini, apples and carrots, which offer moisture and natural sugar. This helps keep the added sugar and fat content low. They are incredibly soft, fluffy and just sweet enough. The best part of these are their crisp top with soft and moist center. I actually discovered how to make the crisp top by accident. I was packing a cooler of goodies for my boyfriend before he went to southern Indiana on a hunting trip. I baked half the batch of muffins right away, but covered the rest and placed the batter in the fridge overnight. I only did this because it was late and I did not want to keep him up by banging around in the kitchen. The next morning I decided to make myself a few muffins and finish off the batter. I was actually skeptical of how these would turn out, considering the recipe has baking soda as the leavening agent. I talk about this more in my science of baking page, but when a recipe with baking soda sits for too long it can loose it’s rise. I will say I was pleasantly surprised with the outcome. 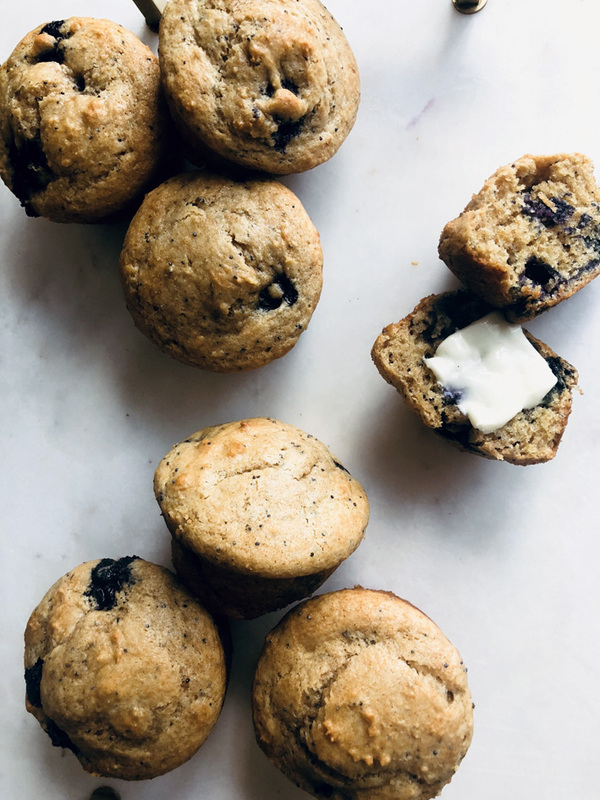 The overnight sitting/chilling caused these muffins to develop a crisp top and edges, while the inside stayed the same as it has always been – incredibly soft and moist. 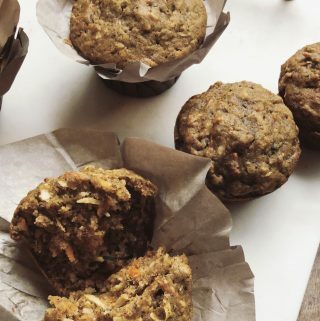 If you prefer a soft top simply throw these muffins in the oven after mixing. If you feel the crisp top is worth the wait, and I feel it is, plan ahead and make these the night before. Mine only chilled for about 4-5 hours and worked great. 1. Preheat oven to 350 degrees. 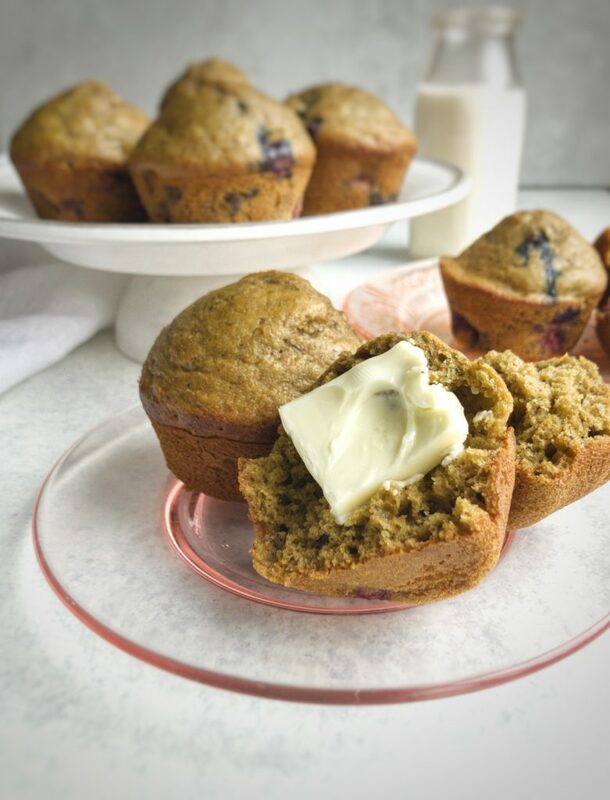 Grease a 12 cup non-stick muffin tin with softened butter or coconut oil, or line with parchment baking cups. Set pan aside. 2. Peel carrot and grate on box grater until you have half a cup. Set aside in a small bowl. Next grate 1/2 cup of zucchini and place in a fine mesh strainer. Lastly, grate apple, skin on, until have 1/3 cup and place in strainer with zucchini. Set aside and allow carrot and zucchini to sit for 30 minutes. 4. In a medium size mixing bowl combine 3 flours, baking soda, cinnamon and salt. Set aside. 5. In a large mixing bowl lightly whisk 2 eggs. Add coconut sugar, cooled coconut oil, shredded coconut, vanilla and milk. Whisk to combine. 6. Go back to the mesh strainer with zucchini and apple and push the mixture against the bottom and sides to release excess liquid. DO NOT put in a dish towel and ring out liquid. You still want some moisture in them. Add the carrot, zucchini and apple wet ingredients. Stir to combine. 7. Add dry ingredients to wet ingredients. Fold mixture together with spatula until combined. This batter will feel thick and look like mostly shredded carrot, zucchini and apple, but its ok! You’re doing it right. Fold in nuts. May also add 1/3 cup dried fruit if desire, I usually pick raisins. 8. Use a large cookie scoop to transfer batter into muffin cups. Fill cups 3/4 full as they will rise some. 9. Place into preheated 350 oven and bake for approximately 22-25 minutes. Baking time may vary with different ovens. I always check my baked goods a few minutes earlier than baking time to ensure they do not over bake. Cook until toothpick comes out clean or with a few moist crumbs. 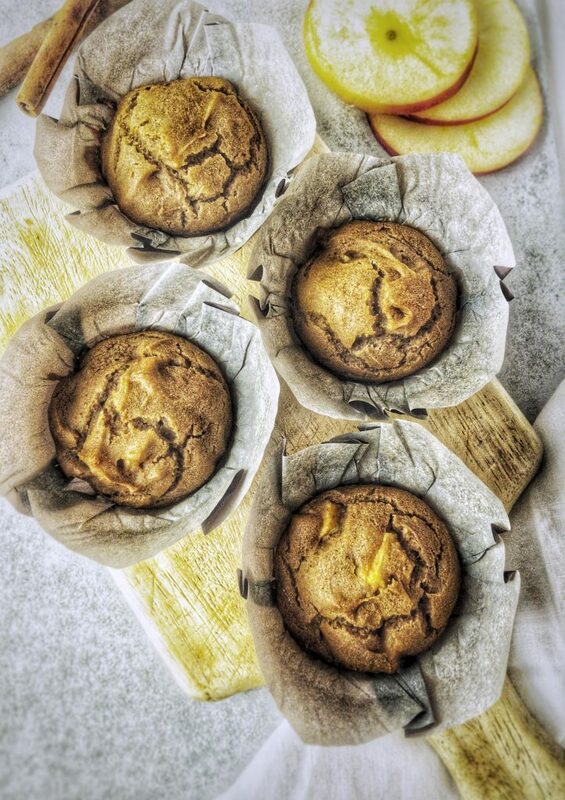 Allow to cool in muffin tins for 10 minutes. 10. Time to enjoy! Now you can start your day off right. • You may use only gluten-free all purpose flour versus the variation above. The buckwheat flour provides a nice lightness to baked goods. If you do not need to be gluten free replace all flours above with standard all purpose flour, or half all purpose flour and half whole wheat pastry flour. • You may use any nut of choice. Feel free to add a small handful of dried fruit also. • I used unsweetened vanilla almond milk, but any dairy free milk will do. • I have used all sorts of apple varieties. My favorite is Granny Smith or Honey Crisp.